The "leniency" of John Terry's ban for racial abuse could cause black players to question whether authorities are really tackling the issue, says former Arsenal midfielder Paul Davis. 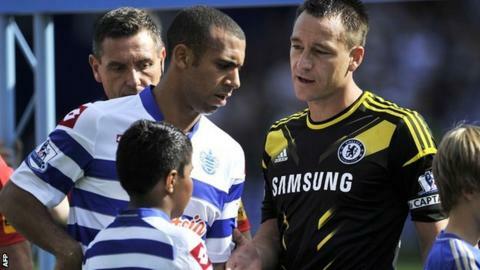 Davis said some black players were "disappointed" with Terry's four-match ban for abusing QPR's Anton Ferdinand. He told BBC Sport: "I think the FA is starting to take things seriously. "But some black players feel perhaps the authorities are not taking [player abuse] as seriously as they should do." Chelsea skipper Terry, 31, was found guilty of racially abusing Ferdinand after a four-day FA hearing, having been cleared by Westminster Magistrates' Court in July. His four-game ban and fine of £220,000 was four games less than that handed to Liverpool striker Luis Suarez, who was found guilty of racially abusing Manchester United's Patrice Evra last season. That led some to question whether Terry's punishment was severe enough. Davis, 50, is a coach-educator for the Professional Footballers' Association as well as a spokesman for anti-racism initiative Kick it Out. As part of his PFA role he is trying to increase the number of black and ethnic minority coaches in England. And he says the Terry and Suarez cases have done "a lot of damage among players". "I've spoken to a few black players who are understandably disappointed that the punishment has been very lenient when you compare it to a similar offence like Suarez's," Davis said. "I felt the Suarez ban and fine was about right, and I would have felt that John Terry's situation would have merited a similar sort of fine and ban because racial abuse is racial abuse whether you say it to me once or 300 times. "I feel that Terry has been fortunate." He added: "It's a worry because you want all players to respect each other and accept each other but, for me, we have to try to move on. Terry has been given a four-game ban and a £220,000 fine, and I personally think John should accept that and get on with it." Manchester United boss Sir Alex Ferguson also said that Terry's ban was "quite lenient" and that the former England captain should think carefully before appealing. "There is a danger of it resurrecting itself because it has been going on so long," Ferguson said. "But the fact he got a four-game ban, he may consider that is quite lenient considering Luis Suarez got eight. It is time to move on and so should the game." Terry's sanction does not come into effect until he has decided whether to appeal or not. Chelsea boss Roberto Di Matteo would not speak about the issue at a Friday news conference, but said he had no concerns about the player as Chelsea prepare to visit Arsenal on Saturday. "He's a professional player and he is a senior player as well," said Di Matteo. "He has played many, many games and has got all the experience in the world to be able to deal with the big game that we play in." Reports of black players boycotting the Kick it Out campaign in protest at the Terry verdict were dismissed by Davis and another PFA source. "I wouldn't really like to see a boycott of Kick It Out's campaign," Davis added. "They have done a fantastic job over the past 12 years changing attitudes among supporters."